The third meeting of the ‘coalition of the unwilling’ – countries opposed to the inclusion of the airlines into the EU Emissions Trading Scheme (EU ETS) – starts today in Washington DC with a pledge by a senior US Administration official that the tone will different on this occasion. Speaking to reporters yesterday, he said the purpose would be to try to explore whether there might be a basis for a global solution on aviation greenhouse gas emissions. He said an aspirational goal had been agreed at ICAO in 2010 of limiting the growth of emissions from 2020 and should a global solution be found, the EU would have to set aside its scheme in the near term. The two-day meeting is expected to be attended by 16 so far unnamed countries, down from the 26 that attended the first meeting in Delhi last September. The EU’s Climate Commissioner, Connie Hedegaard, challenged the countries to come up with concrete proposals for a substantial reduction in aviation emissions. Meanwhile, a US Senate hearing today will decide the next step in progress of a bill to prohibit US carriers from participating in the EU ETS. The Administration official said all the countries participating in the meeting, to be held at the Department of Transportation, were opposed to the EU’s application of its ETS to foreign carriers on both policy and legal grounds, with the previous meetings in Moscow and Delhi asserting that opposition. Asked whether the United States would propose a cap on airline emissions from 2005 levels starting in 2020, the official responded: “I wouldn’t say exactly that. If you go back to the last ICAO Assembly resolution in 2010, there was an agreement to an aspirational goal of trying to limit emissions, I think starting in 2020, at 2020 levels. And I would expect goals of that sort will be part of the conversation we have in our meeting. On the eve of the meeting, an open letter to Secretary of State Hillary Clinton and Secretary of Transportation Ray LaHood has been sent from a coalition of 19 aviation, travel, commerce and trade union organisations. The letter asks the US government to restate its opposition to, and continuing plans for overturning, the application of the EU ETS to international aviation. The organisations urged the Administration to file an Article 84 Chicago Convention action “and to take all other action necessary to overturn this wrongful scheme.” This included support for the bipartisan bills before Congress to prohibit US carriers from participating in the EU ETS. Petsonk said the aspirational goals of ICAO Assembly 2010 resolution were “a reasonable place to start” the Washington discussions but pointed out that the resolution itself pointed out they were not enough to stabilise and then reduce aviation’s climate impact and that more ambitious measures would be required. By coincidence, the US Senate Committee on Commerce, Science and Transportation is due to hold a markup hearing later today to debate possible amendments of the proposed EU ETS Prohibition legislation and then decide whether to pass it out of the committee. This is seen as an important next step in the process before the Senate takes a full vote. Last month, the committee held a full hearing on the proposed EU ETS prohibition legislation to hear testimony from witnesses that included Ray LaHood, Annie Petsonk, Nancy Young of A4A and Jose Delbeke, Director-General of the European Commission’s climate directorate (see article). The U.S. State Department has released a transcript of a news conference held today during which a senior administration official says the starting point for this week’s talks will be the International Civil Aviation Organization’s (ICAO) 2010 resolution. In that resolution, countries set an “aspirational goal” of improving efficiency 2 percent per year through 2020, and then offsetting emissions above 2020 levels starting in 2021 (that’s what their phrase “carbon neutral growth” from 2020 means). Above: the emissions-reductions proposal of the International Air Transport Association (green), and business-as-usual emissions (red). 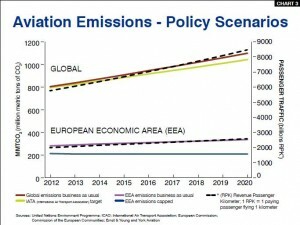 the aspirational goal of 2 per cent annual fuel efficiency improvement is unlikely to deliver the level of reduction necessary to stabilize and then reduce aviation’s absolute emissions contribution to climate change, and that goals of more ambition will need to be considered to deliver a sustainable path for aviation. The industry’s proposal – the green line to the right – is weaker than the ICAO resolution, and allows emissions to continue to grow. 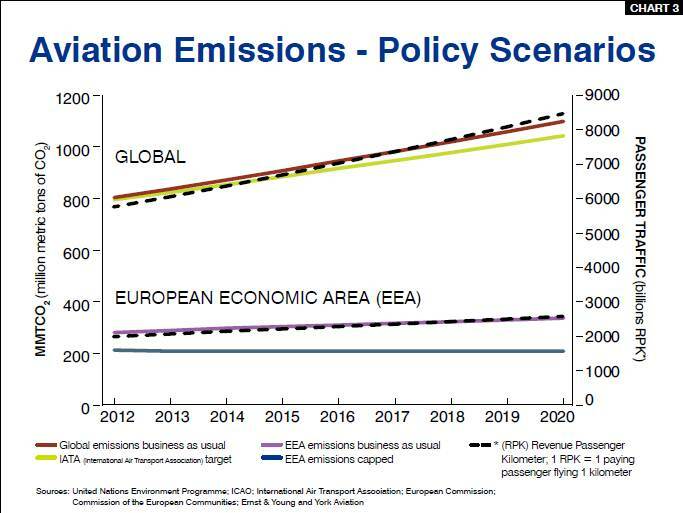 The yardstick we’ll be using to measure any progress in the meeting over the next two days is: are countries speaking in terms of reducing aviation’s total emissions, with binding targets? Or are the talks backtracking to the industry’s lowest common denominator? U.S. climate envoy Todd Stern will be in the hot seat tomorrow — in more ways than one. 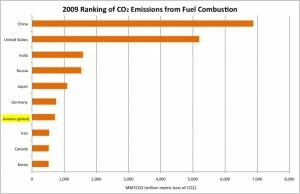 Airlines are the world’s seventh largest planetary polluter. ICAO was tasked by world governments way back in 1997 to come up with a solution to this problem. Unfortunately, they’ve been dithering about it since your teenager was a toddler. Meanwhile, in 2003, Europe suffered a climate catastrophe — a massive heat wave that killed more than 40,000 people. Europe got serious about climate security after the 2003 heat wave. 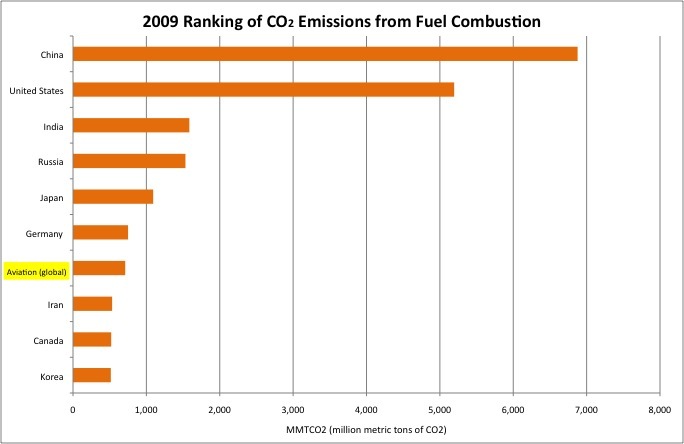 It enacted a law putting most of its industry under emissions caps. Aviation basically got a ten-year grace period from that cap. But this year, for the first time, all planes landing or taking off from European airports will have to reduce their climate pollution. Those that don’t comply will face tough sanctions. The law is causing a lot of complaining from the U.S.-based airlines, including United, American, and Delta. But let’s take a deep breath here. The EU law only requires airlines to cut their pollution by 5 percent. Economists commissioned by the U.S. Federal Aviation Administration to assess the impact on U.S. airlines found that the EU law might … I repeat, might … cost as much as $6 on a roundtrip ticket from the U.S. to Europe. That’s the same as the cost of a beer on a Delta or United flight. Oh, and the economists said “might” because they found that — if the airlines met the EU law by flying more efficiently — they could actually make money from it. So why is this so controversial? Because … while Stern’s meeting is aimed at coming up with new ideas for how ICAO can move forward, and while the EU’s law is actually nudging ICAO in that direction … the U.S. airlines have other ideas. United, American, Delta and their trade association are pressing to have the meeting focus on how to bring legal action against the EU, rather than focus on ways to make progress in ICAO. Specifically, they’re pushing for agreement to bring legal action under Article 84 of ICAO’s governing treaty. Never mind that Article 84 cases are cumbersome, time-consuming procedures that drag on for years and almost never reach a conclusion. The airlines’ real game is to tie ICAO up so deeply in the ponderous Article 84 process that it will never have time to work on a serious agreement on climate change. The airlines are also lobbying hard for Congress to pass legislation barring U.S. airlines from obeying the EU’s law. Legislation like that is almost unprecedented in U.S. history. Last time we saw legislation blocking American companies from obeying the laws of the countries in which they do business was when Congress barred American firms from suborning apartheid in South Africa. That’s what makes Stern’s meeting this week so hot. Posted: Tuesday, July 31st, 2012. Filed in Climate Change News, Recent News.